I promise not to roll in the dirt anymore ! Please..no...don't wash me...anything but that ! He just never learns...so much for old dogs and new tricks. Aww...poor guy! 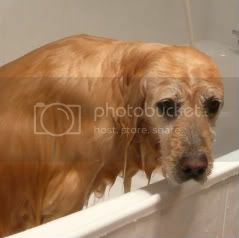 He looks so sad to be in the bath. What a cutie! no there's a hang dog look!